We’ve mentioned before that reader emails are the oil that keeps our engine running, the spiral that keeps our notebook bound, the HDMI cable that delivers the 1080p signal to our HDTV. 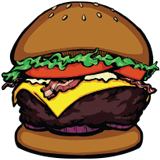 We love and need your suggestions for what burgers to try, so please keep them coming. 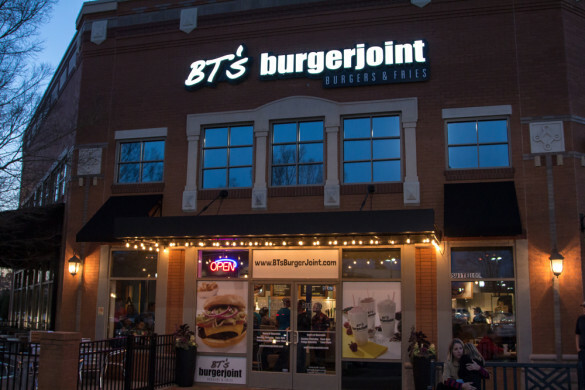 Little burger joints are common in the industrial parts of Charlotte (see here & here), and while the burgers may be delicious the places may not seem inviting to outsiders of the neighborhood. 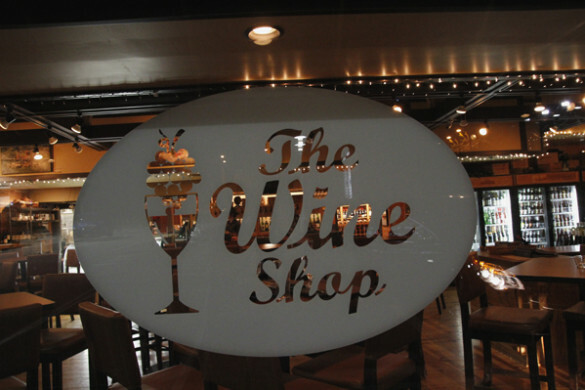 We all know there are some places in Charlotte that are better than others. I could be wrong, but I would consider this one of the others. 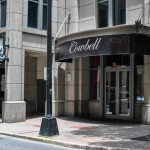 Perhaps that’s why, despite the fact that Rainbow Grill has been around for awhile, this will be its first review on Urbanspoon by a food critic, blogger, or anyone else. Or maybe we’re the first food bloggers to MAKE IT BACK ALIVE. Actually, I’ve lived in scarier houses than this. 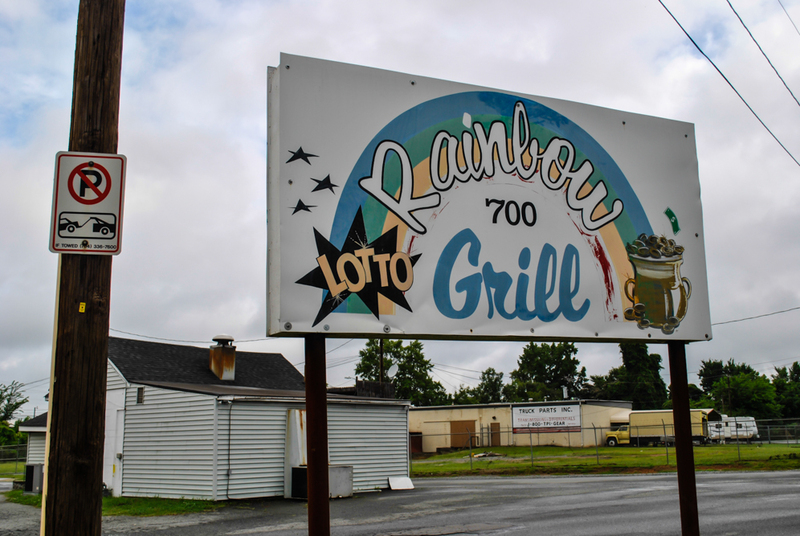 Pulling up in your car, it’s hard to know what to expect from Rainbow Grill. There’s no window by the door, so you have no idea what it’s going to be like inside when you walk in. You don’t know if it’s going to be busy, or dead, or what. You don’t know if when you step inside the record will scratch and everyone will drop their forks and stare at you 1. 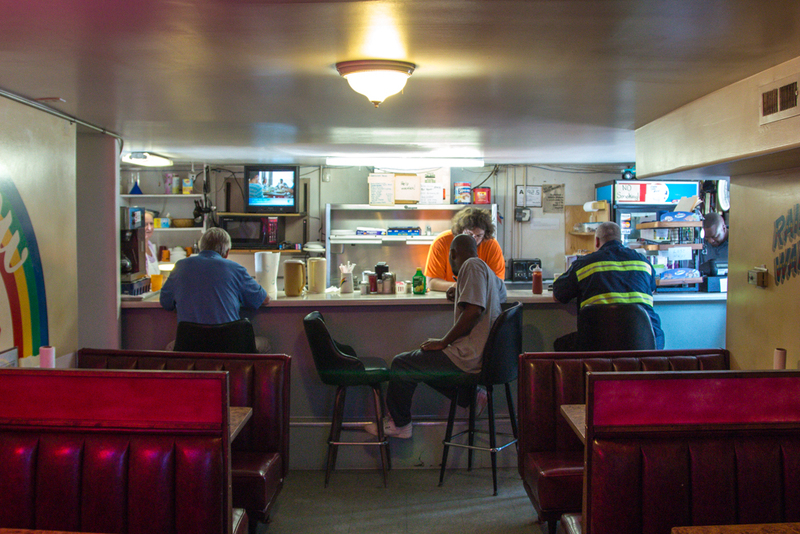 Luckily, that didn’t happen, even though we were carrying a scale and measuring tape.When you walk in you see just a small dining room with just four booths and four barstools. It’s a cozy area. 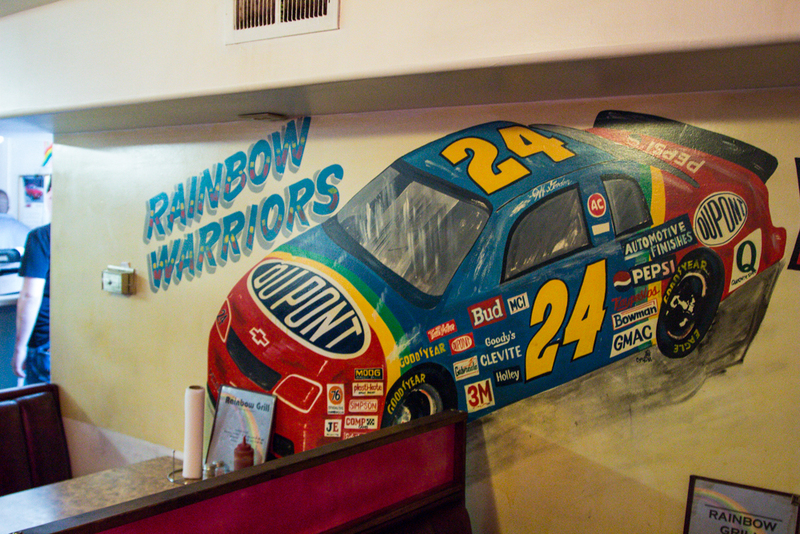 Clearly, the owners are Jeff Gordon fans, because on the wall they have an intricate, hand painted portrait of his #24 DuPont car on the wall. We slid into a booth on the left, directly under a Budweiser sign, which gave our booth a warm-pinkish glow. I suppose the colorful light fit with their name. 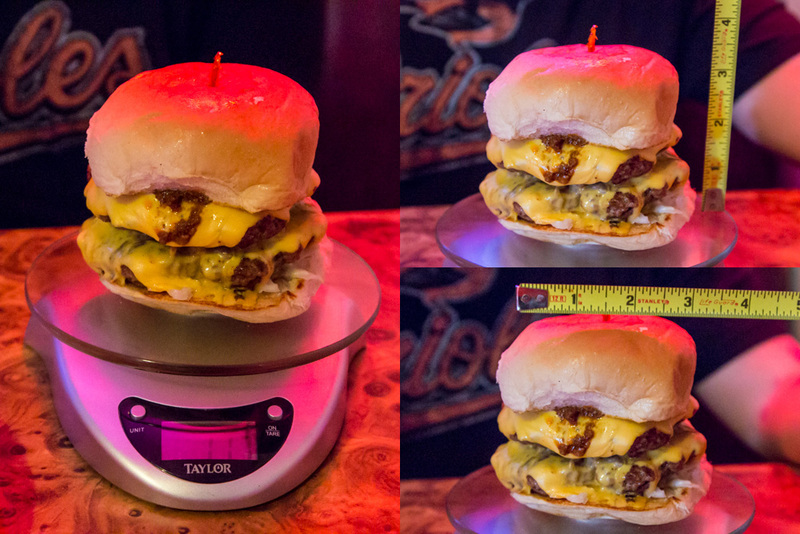 There are three options for burgers at Rainbow: a 6 oz, a 12 oz, and an 18 oz. I briefly considered getting the triple—it was only seven dollars—but Angus scoffed and said there was no way I would eat it all. I hate to admit that he’s right, so I won’t. He was wrong. I would have loved all 18 ounces. I just decided to go with a double because I didn’t want to out-do him. This week’s photos courtesy of the Director of Photography of Batman & Robin. 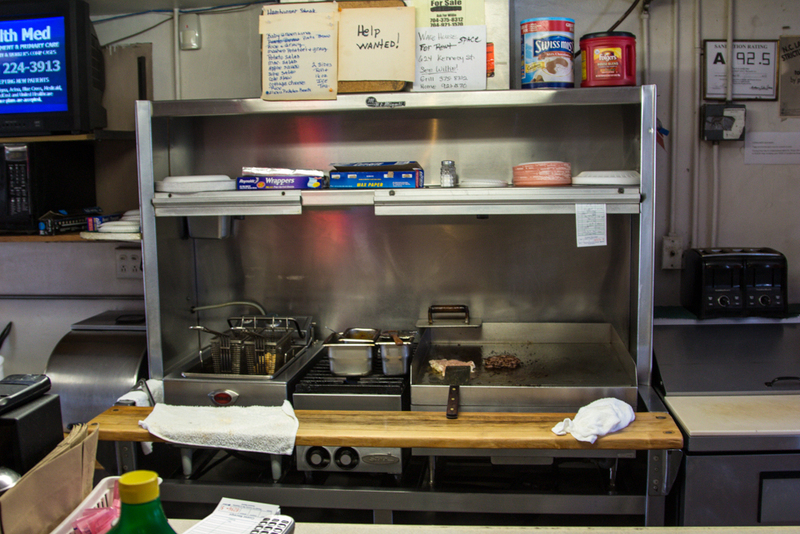 Rainbow Grill’s burgers are fresh, never frozen, and that always makes a difference 2. 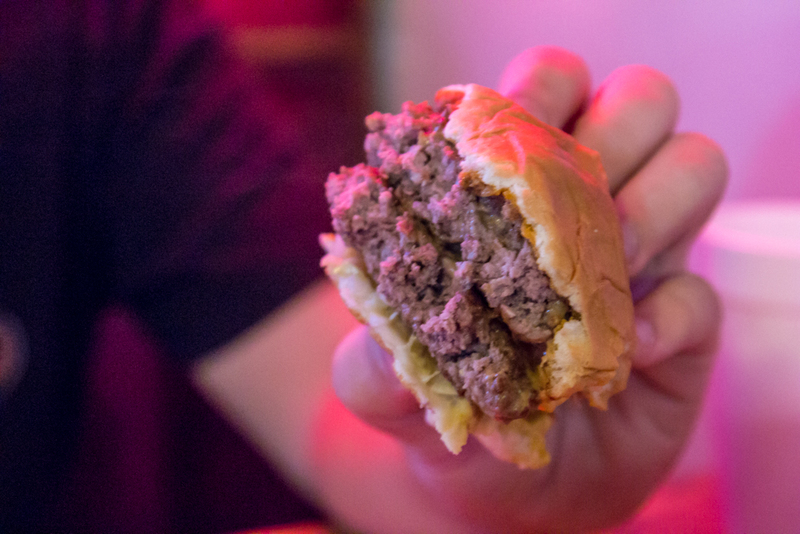 There’s nothing complicated about this burger. It’s just good food, particularly good meat, at a good price. I had it prepared Carolina Style, with chili, mustard, and slaw. But, the toppings were absent, taste-wise. All I could register was burger and bread. And they just have store-bought bread (like Brooks or The Diamond). That was fine with me, though. Pretty much just meat and bread. I don’t need no stinking toppings. In addition to burgers, Rainbow has hot dogs and salads and I’m sure some other stuff. We didn’t get pictures of the entire menu. Just get a burger. They do have beer at Rainbow Grill, and I should have done more to investigate it. I failed to ask exactly what they have, but according to the menu they do offer it by the six pack. Initially the atmosphere rating was going to be fairly low. Sure, they had that awesome Jeff Gordon painting on the wall, but the dining area felt claustrophobic without windows and their TV was tuned to Jerry Springer 3. But, then the server told us there was another dining room in the back and we should check it out. I had no idea what to expect from back there. It was mostly like the first, with one key difference. They had video poker machines. Now, I’ve never played video poker before in my life. In fact, I’ve never gambled before. I’ve never been to Las Vegas, not even to Cherokee 4. 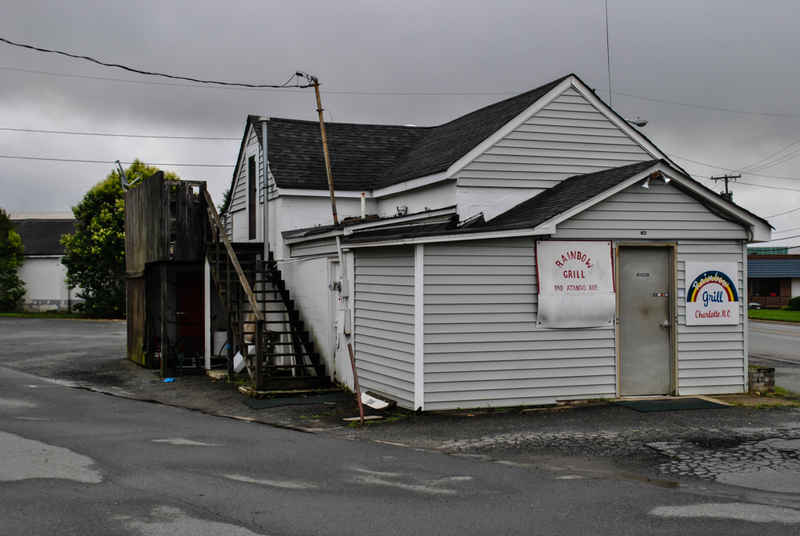 But, wanting to get the full experience of the place, I walked up and put a dollar in the machine. 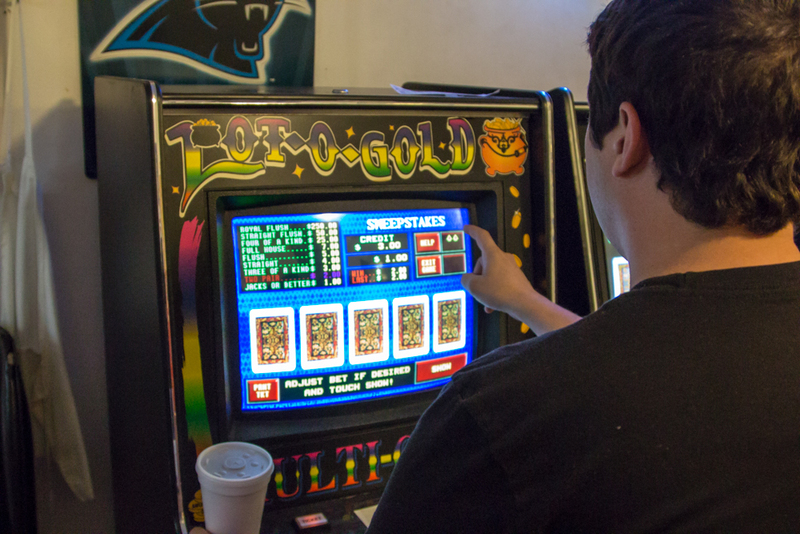 Pictured here: Hereford’s mullet begins growing spontaneously after inserting the dollar into the machine. First hand I played I got a pair. Winner! I decided to let it ride. Another pair! I upped the bet, then I got a straight, and then another pair. Up the bet again! Then I got another straight. Feeling pretty happy with the outcome, I stopped there. Now, these things skirt the edges of legality, so I won’t say exactly what I won 5. But, this experience increased my appreciation of the atmosphere. What was your favorite thing (non-food) about the Rainbow Grill? Obviously, I loved playing video poker when I went, but that was only because I won. If I had lost, it would have been a decidedly more sour experience. 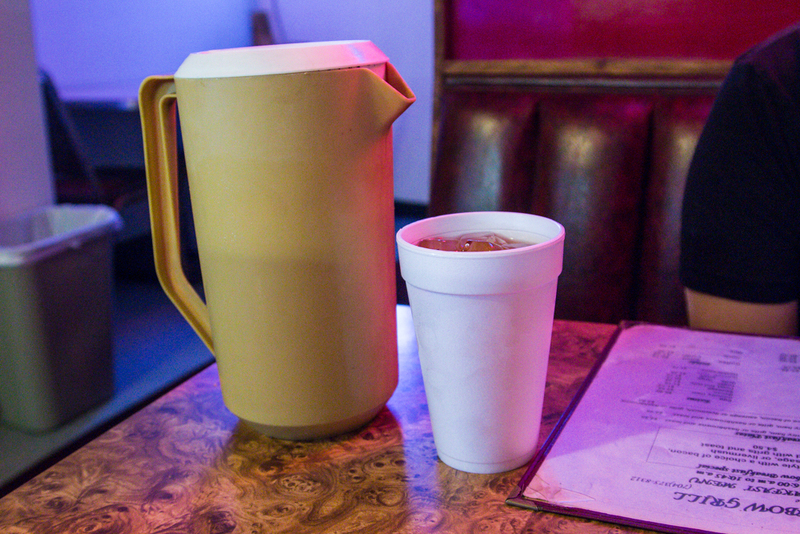 So my favorite non-food thing was that our server left a pitcher of tea for me at the table. I will kill sweet tea at restaurants, and sometimes I feel bad for running the servers around. I wish they would just leave the pitcher with me, so they can take care of customers who don’t come in dehydrated. It was nice I didn’t have to worry about that here. Maybe. It’s out of the way for me, and I don’t want to develop a gambling addiction. I would likely only come back if someone wanted to go there. 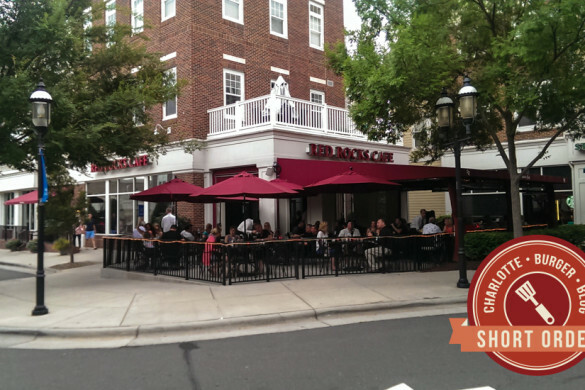 Does Rainbow Grill earn the Charlotte Burger Blog Seal of Approval? 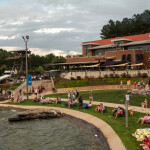 I loved this place, but I’m going to say no. This place is special, but I don’t want to put it in our Hall of Fame if I wouldn’t come back to regularly.